Group B Posts and for the Ceramic Engineering, Material Science, Polymer Science, Atmospheric Science, Physical Oceanography, Psychology posts GATE is not required. Available Engineering disciplines are Electronics & Communications, Mechanical, Computer Science, Physics, and Aeronautical Engineering. Selection for this Engineers Recruitment of Delhi DRDO ADA will be held based on merit in GATE 2015/2016/2017/2018. Eligible candidates can submit their applications using official website of RAC @rac.gov.in. 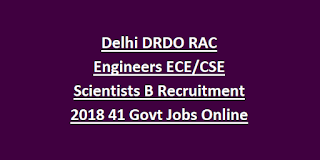 For more information regarding Delhi DRDO RAC Engineers/Scientists recruitment 2018 please see the given details below. 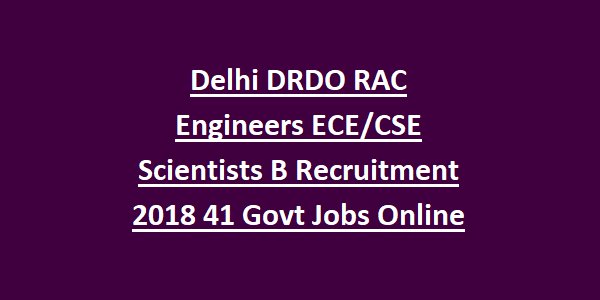 There are total 76 vacancies available in Delhi DRDO ADA Recruitment 2018. Should have passed Engineering in relevant disciplines, For physics the candidate must have qualified Masters Degree in Physics and GATE 2015/2016/2017/2018 score card. Those who are clear the GATE 2015/2016/2017/2018 they are only eligible for these vacancies. Selection for these vacancies will be held based on GATE 2015/2016/2017/2018 marks candidates will called for personal interview. Candidates can submit the applications through online using official web portal of rac.gov.in. Candidates have to submit their application online only on or before 31-05-2018. Candidates appearing in the Final examinations of Qualifying Degree including those who have already registered, are required to upload their final result of qualifying degree i.e. degree/provisional certificates and consolidated marks lists on or before 31-07-2018. Download notification of DRDO RAC Recruitment 2018.